Location of the Yana Bay on whose frozen surface Yakov Permyakov was murdered. Yakov Permyakov (Russian: Пермяков, Яков) (died 1712) was a Russian seafarer, explorer, merchant, and Cossack. In 1710, while sailing from the Lena River to the Kolyma River, Permyakov observed the silhouette of two unknown island groups in the sea. Those islands would later be called Bolshoy Lyakhovsky and the Medvyezhi Islands. In 1712, Permyakov and his companion Merkury Vagin crossed the Yana Bay from the mouth of the Yana to Bolshoy Lyakhovsky over the ice and explored the then unknown island. Permyakov and Vagin were murdered on the way back from their exploration by mutineering expedition members. The cossacks took Permyakov's dead body down to the ice and set it on fire. No one knows what the rebellious cossacks did with the ashes, but Yakov Permyakov's remains were never found. This is a list of islands of Russia. It includes all islands in Russia with an area greater than 3,000 square kilometres (1,158 sq mi) and some of the more significant minor islands. The Laptev Sea is a marginal sea of the Arctic Ocean. It is located between the northern coast of Siberia, the Taimyr Peninsula, Severnaya Zemlya and the New Siberian Islands. Its northern boundary passes from the Arctic Cape to a point with co-ordinates of 79°N and 139°E, and ends at the Anisiy Cape. The Kara Sea lies to the west, the East Siberian Sea to the east. The New Siberian Islands are an archipelago in the Extreme North of Russia, to the North of the East Siberian coast between the Laptev Sea and the East Siberian Sea north of the Sakha (Yakutia) Republic. The Lyakhovsky Islands are the southernmost group of the New Siberian Islands in the arctic seas of eastern Russia. The islands are named in honour of Ivan Lyakhov, who explored them in 1773. Bolshoy Lyakhovsky Island, or Great Lyakhovsky, is the largest of the Lyakhovsky Islands belonging to the New Siberian Islands archipelago between the Laptev Sea and the East Siberian Sea in northern Russia. It has an area of 4,600 km², and a maximum altitude of 270 m.
Sannikov Strait is a 50 km-wide strait in Russia. It separates Anzhu Islands from Lyakhovsky Islands, and connects the Laptev Sea in the west with the East Siberian Sea in the east. It is named after Russian explorer Yakov Sannikov. The Medvezhyi Islands, or Bear Islands is an uninhabited group of islands at the western end of the Kolyma Gulf of the East Siberian Sea. Yarok Island is an island in the Laptev Sea, a marginal sea of the Arctic Ocean. The island is located off the mouths of the Yana river, only a few kilometres towards the east. The Yana Bay is the most important gulf of the Laptev Sea. It is located between Cape Buor-Khaya on its western side and the Ebelyakh Bay at its eastern end. 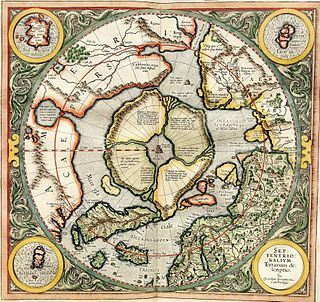 This list of Arctic expeditions is a timeline of historic expeditions in, and explorers of, the Arctic. Merkury Vagin was a Russian Arctic explorer.